Matchweek 23 will come and go this weekend, and with it another chapter in the 2018/19 Premier League Golden Boot race. To this point, the chase has been filled with all the big names you might have predicted back in August. Mohamed Salah, Harry Kane and Sergio Aguero, the league’s top-three scorers from a year ago, once again find themselves in the thick of the things contending near the top. Pierre-Emerick Aubameyang, in his first full Premier League campaign with Arsenal, is living up to his billing and keeping the pace, too. And Eden Hazard, the do-it-all midfielder over at Stamford Bridge, is hanging right up there with all of them, just as he always seems to do. This group has established itself at the front of the pack, and more than halfway through this campaign, it’s time to wonder which of this current top-five will come away with the Golden Boot when all is said and done; a task best accomplished through process of elimination. After finishing as the top scorer at the World Cup in Russia this past summer, Kane kept up his elite form with Spurs in the Premier League this season and currently sits among the league’s top scorers. But the 25-year old striker now finds his quest for a third league scoring title in jeopardy after a left ankle injury suffered against Manchester United has the England captain set to miss at least one month of action. 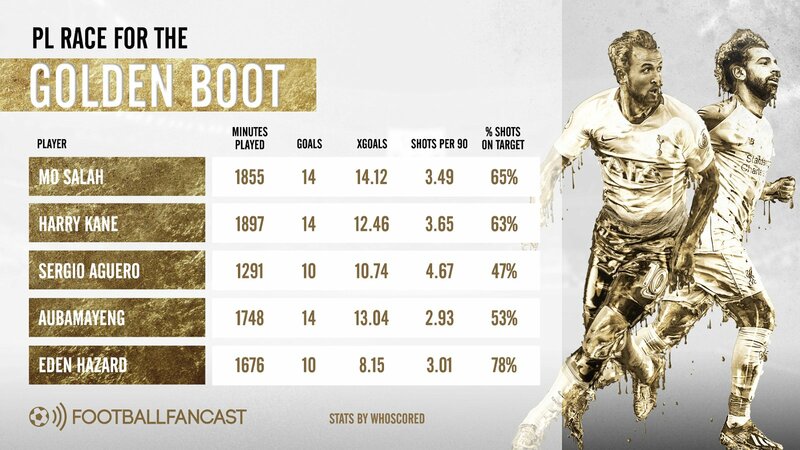 When Kane makes his return in late February, or more likely early March, he’ll probably find himself too far off the pace at the top and soundly out of Golden Boot contention. 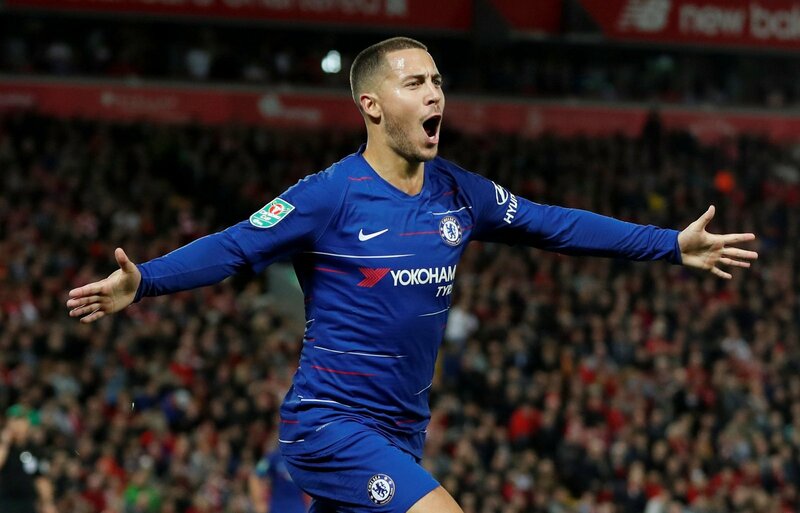 Hazard has remained his masterful self this campaign, picking up 10 assists to go with his 10 goals while planting a remarkable 78% of his shots on target as the motor in the middle of Maurizio Sarri’s machine. The Blues sit fourth in the league with 47 points and have their crafty talisman largely to thank for it. Yet despite his impressive scoring output thus far, Hazard is likely to fall off the pace as well. The Belgian international is averaging only 3.01 shots per 90 minutes, landing him behind all but Aubameyang among the league’s current scoring leaders. More importantly, the heavy burden placed on Hazard’s shoulders at Stamford Bridge does not bode well for him long term as a scorer this season. With Kane and Hazard removed from the conversation, we’re now left with three names: Salah, Aubameyang and Aguero. Sidelined by injury and illness at several points during this campaign, Aguero has seen less of the pitch than any of the top scorers in the league and now faces an uphill battle, four goals off the top with 17 matches to play. The issue: Manchester City’s front-man hasn’t been particularly efficient. Averaging 4.67 shots per 90 minutes while hitting the target only 47% of the time, Aguero has been less effective than usual with the ball around the net. Unless the Argentinian striker cleans things up, he’ll struggle to claw his way up into true contention. With only Salah and Aubameyang remaining, each with 14 goals through 22 appearances, it’s time to jump into the numbers. While the two prolific strikers share an identical goal total, that stat is where the similarities end. Salah’s 3.49 shots per 90 minutes and 65% accuracy both better Aubameyang’s, who is averaging 2.93 and 53%, respectively. The Egyptian from Liverpool is getting more opportunities and when he gets them, he puts them on goal 12% more often. Expected goals are a tricky stat, but they can also shed light on the truth. Some view it as a metric that can show a scorer whose output exceeds the opportunities he has, or vice versa. Others see those outperforming their xG numbers – like Kane and his 14 goals to 12.46 xG – as something of an aberration that will ultimately be balanced out. In this case, we’ll lean toward the latter. 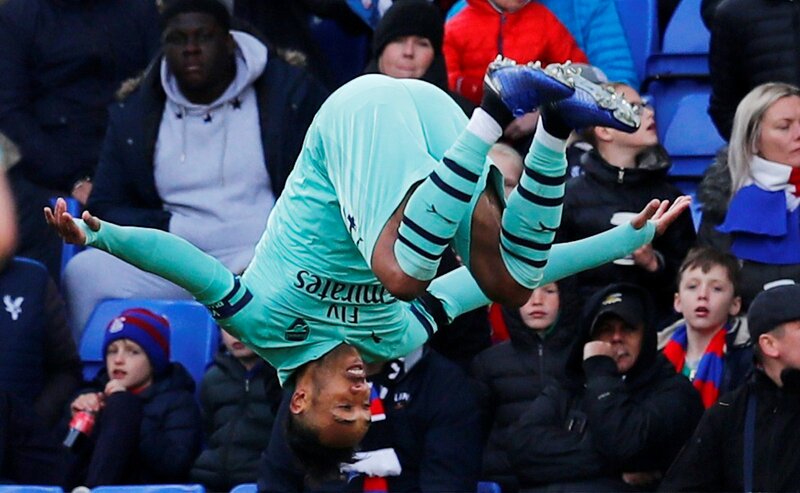 Aubameyang enters the weekend with his 14 goals exceeding his xG of 13.04. He’s outperformed a statistical expectation over the first half of the year, but ultimately the Gabonese international should level, falling prey to his relatively scant shot totals and lower accuracy. Salah on the other hand, sporting an xG of 14.12, had been right on point and so should remain on track the rest of the way. In almost every statistical sense, Liverpool’s No. 10 has Aubameyang far outclassed and would appear to be the more likely contender to hold onto the scoring lead at the very top. Numbers can be deceiving and there’s plenty of football left to be played, but where things stand now, it’s Salah who should be bringing home a second consecutive Golden Boot come May.